Iris Glicee Prints. Gaze upon this soothing image during the stressful times of your life! Giclée Images are for sale only on a custom order basis where the customer contacts me first via email or fax to make an inquiry...... "Spring Thaw" is a 20x30" poster-sized Iris Giclée print on heavy watercolor board. 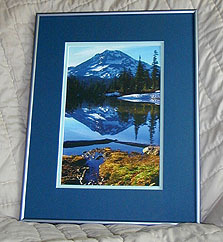 It is based upon an Oregon Cacade mountain scene from the Three Sisters Wilderness Area. The winter ice was just leaving Eileen Lake, and on the lake's sunniest exposure a merry creek was enlivening fresh green life. The overall scene has a magic similar to that of a Japanese reflection pool. See below for a recreation of that morning. 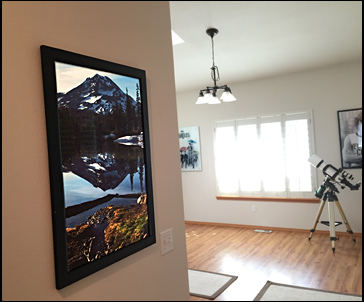 Below is Spring Thaw hanging in a home in Olympia, WA. Size of Giclée print: 20x30 inches. Price, unframed: $98. Printed on textured watercolor board on the Iris 3047 machine using Pinnacle Gold inks. Shown below is a framed print for illustration of the print in proper framing with UV glass and an adequate air space between glass and print surface provided by double mat.... Note: $98 price is for unframed prints and does not include postage and handling to your location. Digital version of "Spring Thaw" for your computer screen use is now available. Cost: Free. Contact me and I will send you the file, which is a jpeg expanding to 1.7 MB when opened and used as your screen background. The image is placed onto a dark gray background which is carefully sized so that your task bar does not cut off the bottom, and your screen icons will fit onto each side of the image, leaving its beauty unimpaired. I was tired and alone, slogging through miles of June snow. Several times I had nearly lost the trail as I gradually ascended the eight-mile feeder trail into the Three Sisters Wilderness of Central Oregon. By the time I reached Linton Meadows at 6,000 feet, I had begun to doubt the wisdom of a trip this high this early in the year. It was the last week of June, but 1971 had been an exceptionally deep snow year in Oregon's Cascade Mountain range. But so close to the summer solistice, there were long hours of daylight, and by 8pm I had hiked another mile away from the meadows, toward a small lake named Eileen Lake. On my map, it looked like it might have some good camping spots. But when I arrived there near 9 p.m. sunset, the only snow-free ground I could find was at the north end of the lake, and it was not an established camping area. But by then darkness was falling, so I threw my sleeping bag on a flat, dry spot of ground, and had a quick cold meal and fell asleep easily. The pure light of morning awakened me to the scene captured in this 20x30 Iris Glicee image which I title "Spring Thaw, Three Sisters." As the night's chill quickly evaporated, the peace of the awakening lake filled me. I spent a long time absorbing the beauty with my eyes; the image cannot give you the wonderful sounds my ears were hearing: the calls of birds, the tiny trickle of the little stream entering the lake. Far away, high on South Sister Mountain, I heard a distant rumbling as rockfall let loose on the Lost River Glacier.